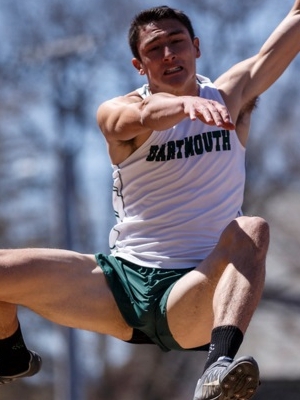 Dartmouth’s Corey Muggler is the only athlete to reach a mark over 24 feet in the men’s long jump. At the Alan Connie Shamrock Invitational, Muggler jumped 24’ 1”, which ranks him among the best in program history. Dartmouth has only earned two long jump titles at the championships in 1939 and 1941. The Big Red duo of Austin Jamerson and Alex Rodriguez have jumped identical distances in this event. Their 23’ 8.25” distance rank them second going into the championships, ahead of any other teammates who have qualifying marks. Jake Scinto of Princeton has jumped 23’ 6” this season leading his teammate Greg Leeper who comes into the meet with a 23’ 3.25” leap. Jamerson could compete in this event on top of the decathlon and high jump (he competed in both of those events last year at this meet). Also in the 23-foot plus range is Harvard’s Malcolm Mason Rodriguez and Brown’s Christopher Garzia. 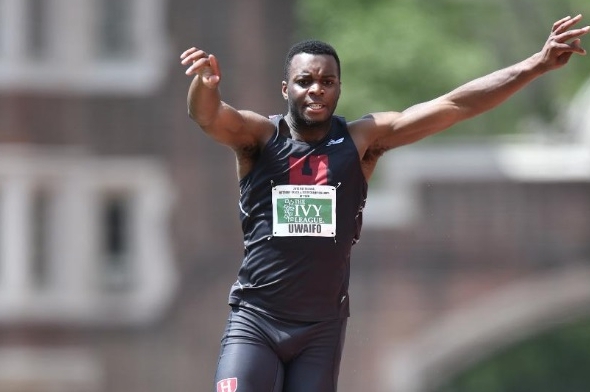 The men’s triple jump title is predicted to go to Efe Uwaifo of Harvard who jumped just shy of 16m at 15.98m (52’5.25”). Harvard has only won this event five times in the last 52 years, the most recent year was 2005. Uwaifo is the top returning scorer from last year and has won the last two Indoor Heps titles in the triple jump. Behind Uwaifo is Cornell’s Bobby Plummer who jumped 50’ 4.75” at the Bison Outdoor Classic, who is the only other athlete who has jump farther than 50 feet so far this season. Cornell has a total of four men in the top 6 of this event. Joining Plummer are John Enkler, James Seaton, and Kelsey Nedd. Taylor Alarcon and Jason Katz, of Brown and Muggler aim to break the shades of red that could make up the top of the triple jump podium. This entry was posted on Wednesday, May 4th, 2016 at 7:00 am. It is filed under Heps Champs, Men, Spotlight, Team Previews. You can follow any responses to this entry through the RSS 2.0 feed.